Which College GameDay Host Has Made The Dumbest Picks This Year? Let’s take a look at how the experts on the ever-popular ESPN College GameDay show have fared with their weekly game predictions this year. With the help of Cole’s Gameday Blog, we have compiled all the picks of Lee Corso, Kirk Herbstreit, and Desmond Howard. We then calculated each pundit’s Hit Rate, which is the percentage of picks that were correct, and Yield, which is the average payout had you bet $1 on each of the expert’s picks at Moneyline odds. The Yield awards pundits more credit for out-of-consensus picks and is the core metric we use for grading pundits at PunditTracker. Note that Corso, Herbstreit, and Howard do not all pick the same games each week. Howard, who had made the fewest picks thus far, has turned in the best performance, hitting on 74% of his predictions with a superb $1.10 Yield. 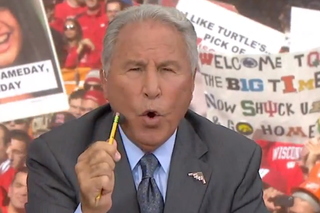 Herbstreit has not added or subtracted value with his picks, generating an even $1.00 Yield, while Corso has struggled, posting a meager $0.89 Yield. Here are the 10 Best & Worst picks of the group. We define Best as the picks with the highest Yield and Worst as the incorrect picks with the highest point differential. For the Best and Worst picks for each of the pundits, click here. Corso is an even .500 this year with his Headgear Picks; since 2010, his record is 38-18 (68% Hit Rate). We will continue to track all three pundits throughout the year. Meanwhile, start building your own track record for everyone to see by making picks on all the big games this weekend as well as predictions on the BCS Title, Heisman Trophy, and next USC coach. Just head over to our NCAA Football section to do so – use the ‘Vote Now’ buttons to make your selections. You can also see a full breakdown of all the picks of Corso, Herbstreit, and Howard there.